Succession planning refers to the process in which employees are recruited and developed with the aim of filling a key role within an organizationCorporationWhat is a corporation? A corporation is a legal entity created by individuals, stockholders, or shareholders, with the purpose of operating for profit. The creation involves a legal process called incorporation where legal documents containing the primary purpose of the business, name, and location. It increases the availability of experienced and competent employees who are prepared to replace old leaders as they leave, retire or die. The preparation for the employee to take over leadershipCorporate StructureCorporate structure refers to the organization of different departments or business units within a company. Depending on a company’s goals and the industry which it operates in, corporate structure can differ significantly between companies. Each of the departments usually performs a specialized function involves a transfer to a specific department or job and on-the-job-shadowing to give the employee an opportunity to learn and observe the role being carried out. Succession planning ensures that there is no leadership vacuum after the retirement or exit of a senior officer in the organization. In the case of family business, it ensures that the business continues to run even after the exit or death of important persons in the business. The process starts by looking at the exiting leader’s skillsKey Performance Indicators (KPIs)Key Performance Indicators (KPIs) are measures used to periodically track and evaluate the performance of a business or organization toward the achievement of specific goals. They are also used to gauge the overall performance of the company against other similar companies within the industry. and finding potential replacements from within or outside the organization. If there is a perfect fit internally, the employees then undergo training so that they can oversee the roles performed by the leader. In most cases, they work closely with the person as a way of learning how to carry out the various functions with ease. In large companies, succession planning is an ongoing event in anticipation of changes in leadership. 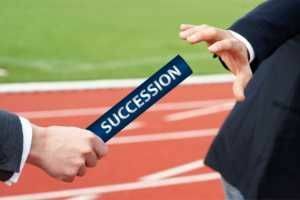 Some organizations even put in place an emergency succession plan to allow for a smooth transition when a leader expectedly resigns, is incapacitated or dies. A long-term succession plan guarantees an organization that there are employees waiting and ready to take over key management roles. The succession planning process continues to gain popularity among companies in recent years, with North American and European firms taking the lead. In major companies like Nike and IBM, succession planning is identified as part of an ongoing talent management program to groom future executives. In addition to annual performance evaluations, senior executives engage in a series of discussions on the employees who’ve shown readiness to take on more significant roles, especially when there are anticipated vacancies. The top management prepares a list of candidates based on the potential and readiness of employees for future job opportunities to make it easy to fill in gaps as they arise. Candidates identified to fill future vacancies undergo assessments to measure their ability to manage complex management operations. Although there is no standard formula to conduct the assessment, senior leaders use various tools to analyze the individual capability of the candidates. These tools may include simulation, cognitive testing, team-based interviewing and personality testing. Elliot Jaques, a Canadian psychoanalyst and organizational psychologist, suggested that the assessments should be narrowed to only focus on critical differentiators of future performance. According to researchers, the most effective practices for evaluations are those that involve multiple raters and methods. Performance calibration meeting involving more senior leaders provide an opportunity to discuss succession at greater levels of depth. These meetings provide an avenue for top business leaders to discuss talent information and reach agreement on performance appraisal ratings. Organizations are now moving away from the once-confidential process of hand-picking successors to a more transparent process of identifying high-performance leaders and preparing them for top leadership positions. Succession planning helps reduce cross-training that involves preparing employees to perform specific functions temporarily when key officers resign. In cross-training, the employee’s role is to keep the company’s mission on track until a suitable replacement is found. Cross-training is not as effective as succession planning since the latter involves getting a fully trained employee take over the role of the former occupant of the position. Also, an effective succession planning strategy will help boost the employees’ self-esteem and self-respect. Succession planning can help identify employees with unique abilities and skills that can help them move up higher executive roles. The process of succession planning can also help identify an employee’s weak areas and where talent training could help to improve performance outcomes. Replacements who come from within the organization understand its operations inside out and are better placed to undertake specific executive roles, especially in firms where knowledge is specific. The need for available replacements when making changes to the organizational structure allows senior management to make changes without being affected by lack of qualified personnel. Since succession planning takes replacements from within the organization, the organization can save on costs that would otherwise go to external recruitment. Companies spend millions of dollars annually on hiring reputable HR firms to find suitable external candidates. The cost of hiring a senior officer can be significantly higher than when sourcing potential candidates from within the organization. Moreover, it is more advantageous and cheaper for the organization to get an employee work alongside a retiring senior executive before the knowledge escapes the organization. An organization can identify competency gaps among its employees through strategic succession planning. Competency gap is the distinction between the current competency level of the employees and the required competency level. The gaps may be due to lack of employees with the requisite skills, current needs for key executive positions and key competencies that may be needed in the future. The gaps will guide the organization in structuring the training or talent management programs to make sure that the employees are equipped with the required skills to perform more demanding functions. Any change can make or break an organization, depending on how the management handles it. With the exit of a key member of the top management, a company should find a replacement who can perform duties better than the previous officer. If there is no perfect match for the position, the company may experience challenges that if not addressed early enough can potentially lead to its downfall. If done the right way, it can inspire employees to be involved in critical decision-making functions. Employees can also maintain loyalty to their employer since succession planning prepares them for career progression. BureaucracyBureaucracyThe system or arrangement to maintain uniform authority within and across institutions is known as bureaucracy. The word bureaucracy essentially means to rule by the office. One of the first people in modern times to think seriously of bureaucracy was a German sociologist, Max Weber (1864-1920).